Great experience. Service was great from arrival to departure. Food outstanding. The service was a little slow. Not all staff were entirely friendly but our main table server (lady) was very attentive. Our food was good, I had the King fish which could've had a little more seasoning but tasted fresh. My partner had the lamb and he was very satisfied with his meal. Tiramisu was very tasty. Really local food, excellent quality and service, not expensive. Xmas day lunch. The food was the best Italian we have eaten yet in all our visits to Italy. Lemon and shrimp pasta was divine and the flavours mouth watering. And the black squid ink pasta with calamari was the tastiest meal he’s ever had said hubby. Perfect tiramisu. Great texture and have had some truly sloppy ones in the past! The menu was concise but with perfectly balanced choices. And Giuseppe and his family were wonderful hosts. Some dishes were excellent but others were disappointing. The pasta with shrimp and lemon sauce lived up to reputation. The grilled octopus appetizer was very odd and lacked flavor, pairing of mashed potato, sauce and grill flavor didn’t work. Zucchini flower appetizer seemed under cooked. Meatballs were great. Mixed pasta with seafood won a rave. House wine was excellent. Excellent service, food and atmosphere. Highly recommend. Everything was fantastic! The staff was attentive and the food was great. Really delicious meal for two. We had the lemon prawn pasta and spaghetti and meatballs - both simple but absolutely divine pasta dishes. Finished with a shared dessert of the lemon cake, also delicious. 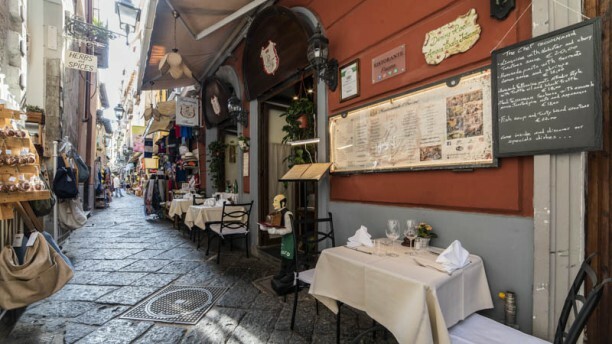 Service perhaps a little distracted but felt like a family business to us and with food that good we could live with it :) €52 for two mains, half bottle of wine, water and shared dessert - best value we have had in Sorrento and the tastiest so far. The food was amazing! It was more expensive than other restaurants by a little bit (compared to the restaurants we’ve been dining at over the last couple of weeks, which are similar) but it was worth it. The caprese, the pasta with shrimp and lemon cream sauce, the gnocchi and the lemon cake dessert. We’re going back again before we leave the area, it was great. These people are so nice and accommodating but the FOOD IS AMAZING!! We literally went back the next day for the lemon shrimp pasta !! The place was very nice great service and great food. The food was excellent, the service was great and very reasonable for the price we paid. I would definitely recommend this restaurant. Nice restaurant, friendly staff and good food! The service was good, the food was good. We were not disappointed. It was typical of the many restaurants in the area. If you are looking for a "food experience" this is not the place. Expect a very tasty meal, but not a huge"wow" factor. That being said, I would recommend it. Food was lovely and the service was great!